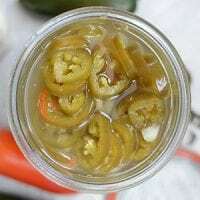 These naturally fermented jalapeño peppers are raw and full of enzymes and beneficial, gut-loving bacteria! If you love spicy food but you've never fermented before, this is a perfect place to start. Makes 1 quart. Slice the peppers about 1/8" to 1/4" thick. Add the peppers and garlic to a quart-size Mason jar and pack them in. Fill to the neck of the jar. Add salt and starter culture to the jar. Cap jar and leave out to ferment for at least 3 days. You can ferment up to 6 months for a very strong batch. Check the jar twice a day and "burp" to let out built up gases. When you're ready, transfer the peppers to cold storage where they will keep for several months.